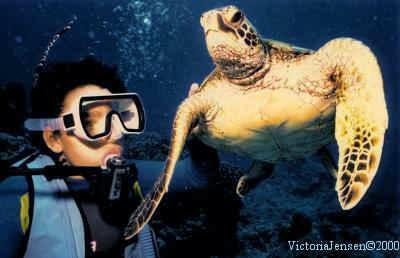 Anyone who's done any diving off the Kona Coast is likely to have met the famous green sea turtle,"Miss Piggy". She always seems glad to see us and is a photographers delight as she can be quite the photogenic little ham. 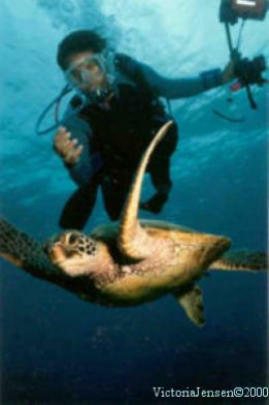 When I wasn't diving North of Kona (South Kohala is a major turtle sanctuary), where I lived, I would play and work with the people at Jack's Diving Locker off the Kona Coast. 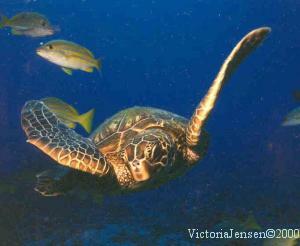 Nearly every time we arrived in her territory she would show up before the first diver was in the water. As far as taking pictures goes, all one has to do is hold up the camera and wait for her to be just the right distance away as she comes swimming toward you. While trying to capture this photo, Miss Piggy drifted into my daughter's head a couple of times (did I mention she was a ham? ), making it necessary for her to gently push her away a few inches. Although you are not supposed to touch turtles, people that don't know better always seem to want to touch or hold on to their shells. I have yet to see a turtle that didn't get uncomfortable and flinch away from this. Since turtles need air to breathe, I have likened it to the anxiety we feel when someone places their hand on your head holding you under water. Miss Piggy being less shy than any turtle I've ever known, has nipped a couple of people that got too touchy, grabby with her. Aggression is very rare unless she feels defensive and in danger. The darker, yet also humorous side of Miss Piggy is that she can get a bit jealous if everyones attention becomes focused away from her because someone found an octopus, a friendly eel or a frogfish. She'll swim around and in and out of the group to make sure everyone is aware that SHE is there too! Once though, I saw her be a total little brat. One of the charters had requested video. My boss, Jeff Leicher, did the video, I had my own group of 4 and was focused on my party. From my perspective I only noticed Miss Piggy visiting the two groups in between her trips to the surface for air. Anyway after the dive I hung around while he was editing the tape and the charter was really hamming it up. Way in the background you could see this little speck getting closer and bigger and Jeff says "Watch her, the little booger is going bite this guy." She came up behind him, swooped in front of him and nipped him on the arm and then swam off tilting her shell to and fro, like a see-saw, all tickled with herself. I couldn't believe it! I told him "You gotta put the Jaws music on that approach!" I never saw her do anything like that before or after that time. I don't know if it was the guy getting all of Jeff's attention or some vibe he was putting off while clowning around. We couldn't help ourselves. We were rolling with laughter even after watching it for about the fourth time. About then the charter called Jeff to make sure he wasn't going to edit it out. She hadn't hurt him and he thought it was pretty funny himself. We all agreed it had not really been an act of aggression since she really wasn't trying to hurt him. It was more like "Ha! Gotcha!" Her little quirks really remind me of a couple of affectionate parrots I have known. Because she was dubbed "Miss Piggy" we have always referred to her as a "she". 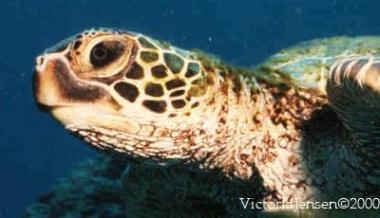 In reality it's near impossible to tell male and female turtles apart until they reach maturity. In Hawaii they take 10 to 50 years to sexually mature, though average is 25 years. 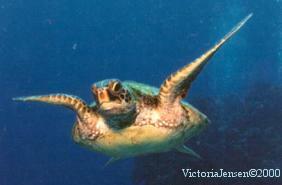 The male develops a long tail which can be as long or longer than his back flippers. 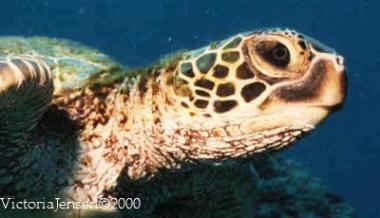 The female's tail barely sticks out of the end of her shell, as it does during the youth of both the females and males.